The devices are also running a custom UI called VIA Plus, which Matthew McRae, Chief Technology Officer at Vizio assures us will be found on any future smartphones, tablets, and TVs from the company. "Whether consumers are looking to enjoy content on the big screen, on their tablet or on a mobile phone, VIA Plus delivers on the promise of Entertainment Freedom for All by creating a rich and consistent user experience across all devices that's accessible to everyone, from the power user to the casual browser." The VIA Tablet will definitely be a great option for those looking for an Android tablet, particularly if you already own a Vizio TV. Still, we're bound to see a lot more tablets in a few days at CES, so we'll have to wait and see if this tablet remains competitive. Irvine, CA-January 3, 2011 - VIZIO, America's #1 LCD HDTV Company*, announced today it is expanding into the mobility category with the VIZIO smartphone and tablet (referred to as the "VIA Phone" and "VIA Tablet" below) -- both part of the VIA Plus ecosystem, the next generation of VIZIO Internet Apps™, that features a unified, sophisticated and intuitive user experience across multiple CE devices including VIZIO HDTVs, Blu-ray players, smartphones and tablets. "Both the VIA phone and tablet feature the highest performance coupled with innovative features that tie them into the media consumption experience," said Matthew McRae, Chief Technology Officer at VIZIO. "And by integrating the VIA Plus user experience also found on our next generation TVs and Blu-ray devices, VIZIO is delivering the multi-screen, unified ecosystem others have talked about for years and never delivered." The VIZIO VIA Phone features a 1 GHz processor, 4" high-resolution capacitive touch screen, 802.11n Wi-Fi and Bluetooth connectivity, GPS, a MicroSD card slot for memory expansion and HDMI output with HD video playback. It also features a front-facing camera for video chats and a 5 megapixel rear camera for photos and HD video capture. 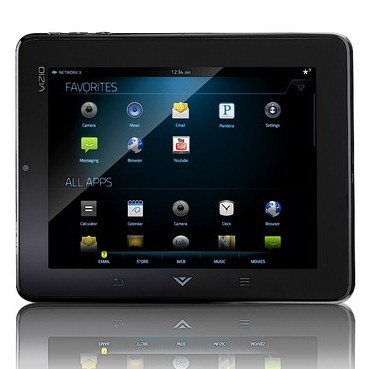 The VIZIO VIA Tablet also features a 1 GHz processor, with an 8" high-resolution capacitive touch screen, 802.11n Wi-Fi and Bluetooth connectivity, GPS, a MicroSD card slot for additional memory expansion, HDMI output with HD video playback, and a front-facing camera for video chats. It also boasts a unique three-speaker design for stereo audio in both portrait and landscape modes. Both devices include a built-in IR blaster with universal remote control app for quick access to the entire home theater or nearly any other CE device in the home. Both run on the Android™ Platform, which will also allow users to access thousands of apps through Android Market™. "As part of the VIA Plus ecosystem, the VIA phone and tablet are natural extensions of the HD entertainment experience that historically has centered around the TV," added Mr. McRae. "Whether consumers are looking to enjoy content on the big screen, on their tablet or on a mobile phone, VIA Plus delivers on the promise of Entertainment Freedom for All by creating a rich and consistent user experience across all devices that's accessible to everyone, from the power user to the casual browser." 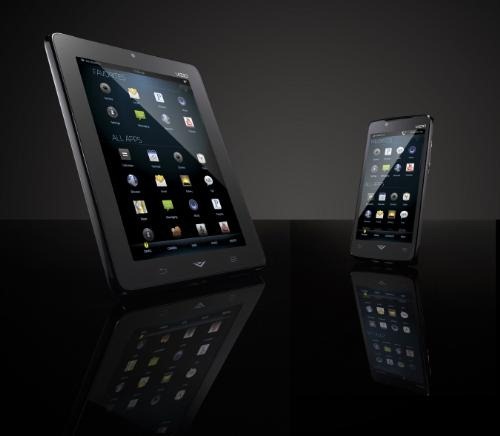 VIZIO will be demonstrating the VIA Phone and VIA Tablet in their private CES showcase at the Wynn Hotel from January 6 to 9, 2011. Irvine, CA-January 3, 2011 - VIZIO, America's #1 LCD HDTV Company*, announced today the VIA Plus ecosystem, the next generation of VIZIO Internet Apps™ that will provide consumers with a connected CE experience unlike any other. The new ecosystem will allow for unified on-demand content and application consumption across multiple consumer electronic devices including VIZIO HDTVs, Blu-ray players, SmartPhones and Tablets. "The promise of a unified consumer experience across multiple screens and devices has been unfulfilled until now," said Matthew McRae, Chief Technology Officer at VIZIO. "With VIA Plus, VIZIO is delivering the first true integrated ecosystem across multiple classes of devices and enabling a simple yet powerful interface for consumers to enjoy their applications, services, and content." "In the upcoming era of connected digital devices, we believe the companies that stand the best chance of success are those that realize the consumer experience isn't just about hardware. Rather, it's the integration of hardware, software, and services toward a specific usage model that will ultimately offer a unique and potentially lasting consumer experience," said Richard Shim, mobile computing analyst with DisplaySearch. "One of the usage models that we believe can be addressed most readily is the consumption of high-quality digital entertainment." "We know we have tremendous interest and support from our current distribution for new VIA devices, but always are mindful of what the end user wants. With the proliferation of platforms and apps now available to connected devices, navigating and learning different interfaces can be frustrating to end users," said Mr. McRae. "With that in mind, VIA Plus presents a simple, consistent, and elegant interface so users can quickly access the entertainment they seek on devices from a 4" mobile phone to a 65" Theater 3D HDTV."